If you want a cozy, comfortable, convenient and cost effective unit this tastefully decorated condominium beats the heck out of renting a hotel room. 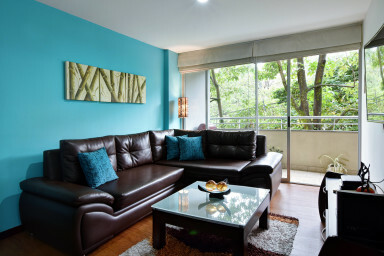 This apartment's Colombian style design sets it apart from other similarly priced units in Medellin. Popular with repeat visitors, it is ideally located in walking distance to the best restaurants in Provenza, one of the city's most popular neighborhoods. Just a few blocks away from Calle 10, Vizcaya Mall and Parque Lleras, it is surrounded by restaurants, bars, nightlife, grocery stores and shops. The unit features free Wi-Fi, flat-screen TV, ample storage, refrigerator, fully equipped kitchen, microwave, telephone, and professional 24-hour management. No charge for extra guests. It is quiet and green but still a stones throw away from Medellin’s number one tourist destination – Parque Lleras.